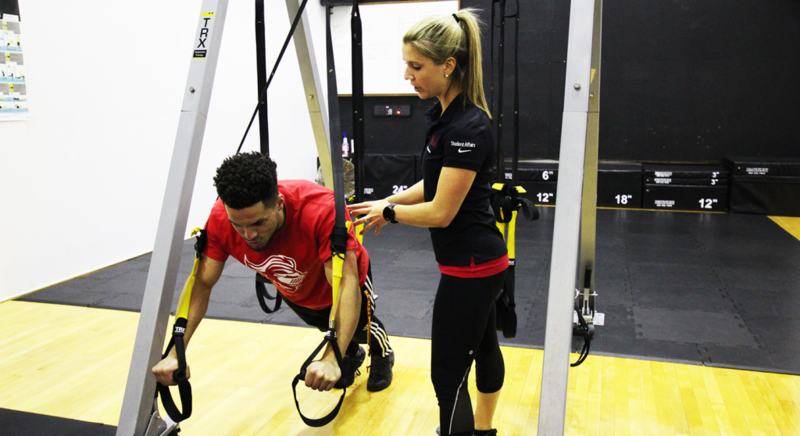 Rutgers Recreation offers personal training services to assist you with your fitness goals. Whether one-on-one or with a small group, professional trainers will work with you at one of our conveniently located facilities during a time that best fits your schedule. These services are offered for paid members/students and complimentary members. Sign up in person at the College Avenue Gym Business Office (Room 105) or the Werblin Recreation Center Business Office or online through the links provided below. All new clients must begin with a start-up package. Immediately following the purchase of your start-up package, you will receive an emailed recept with an online form which needs to be completed at your earliest convenience. After this form is submitted, you will recieve an email from the PT Coordinator with your assigned personal trainer based on your individual preferences and availability. Once Start-Up sessions are completed, clients may purchase continuing personal training sessions. (2) 1 hour sessions consisting of an InBody® assessment and consultation, fitness assessment and personalized workout. (1) ½ hour session consisting of a comprehensive InBody® assessment, consultation and nutritional guidance. After a Start-Up Package is complete, clients may purchase continuing session packages with the choice of 60 or 30 minute sessions. Any questions can be directed to rec.pt@echo.rutgers.edu or call Bethann Wittig at 848-932-8110. The small group training program offers varied classes lead by our nationally certified personal trainers designed to accelerate your fitness and help you reach your individual goals in a semi-private, motivating setting. Rutgers affiliates who are seeking measureable, cost effective results will benefit from these classes. Classes are kept small (4-8 participants) to address special needs and accommodate different goals. Weight training is vitally important for women to enhance muscle tone, boost metabolism, maintain a functional lifestyle, and see a positive change in body composition. With guidance from a female personal trainer, female students will work out together throughout the progressive weeks to target multiple muscle groups within using various fitness equipment. Classes are kept small to address special needs and accommodate different goals. This progressive program, geared towards individuals ages 35 and over, focuses on functional movements that are necessary to live a productive and active lifestyle. Our personal trainer will guide you through a total body workout to increase stamina, strength, mobility, and flexibility. Participants will learn to use a variety of fitness equipment including free weights, functional fitness equipment, TRX, and more. Fitness Challenges – Coming soon! Do you want to know what you are made of? Body composition analysis is essential to completely understanding your health and weight. Traditional methods of assessing health do not always give enough information. Going beyond your bathroom scale thru the InBody assessment can give you valuable information including: fat, lean body mass, minerals, and body water. 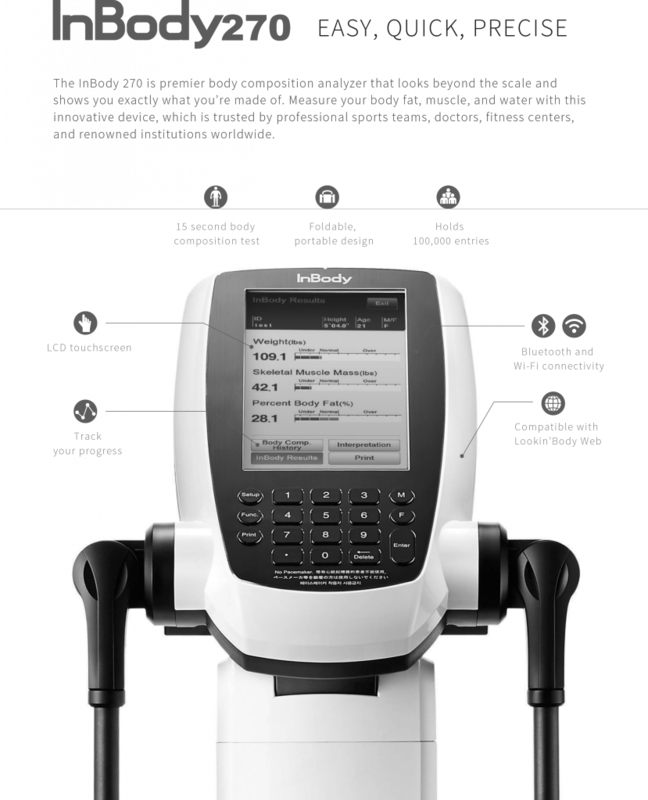 InBody measures your body composition and displays it on an organized, easy-to-understand Result Sheet with a detailed analysis of locations of fat and lean muscle, quantities of water levels in the body, and a guide to helping you achieve your goals.quantities of water levels in the body, and a guide to helping you achieve your goals. Appointments are available for the semester. Please click on the link below to see open appointments and register.